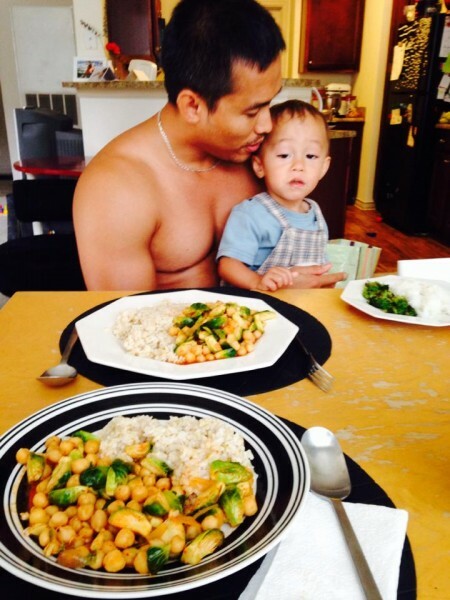 Many of my friends ask me that after they find out I love making Thai food for my Thai hubby. 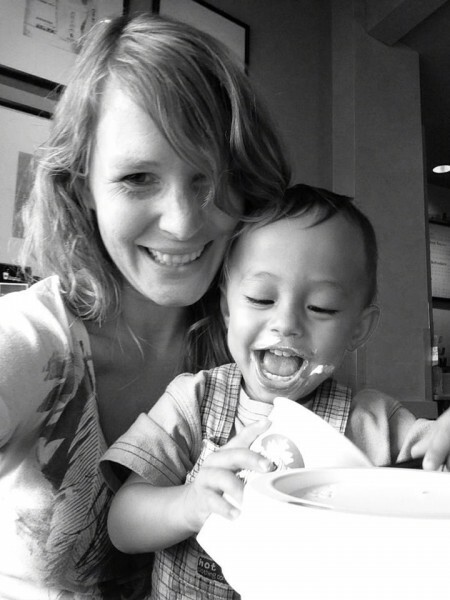 And I’m sure many of you also wonder how our daily meals end up looking with an American girl, Thai hubby, and Thai-American son around. 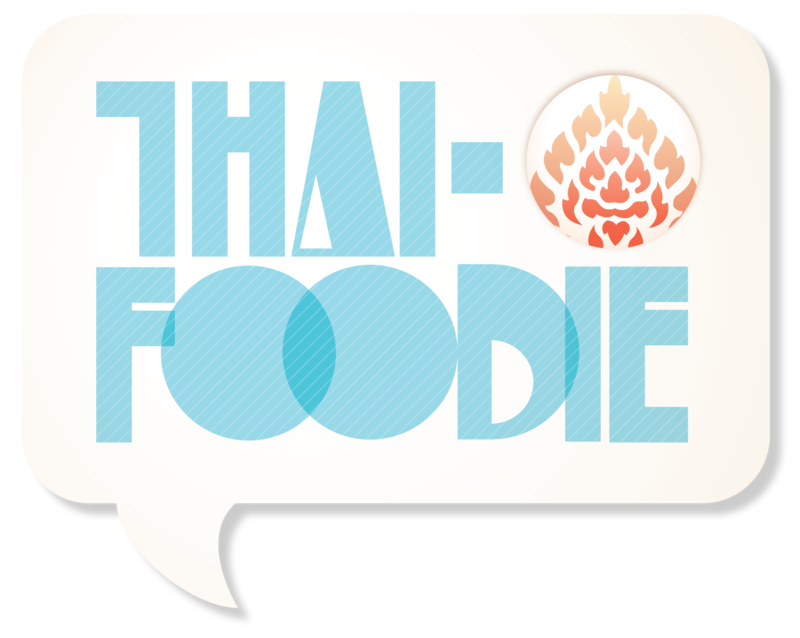 So just for fun, and to maybe give you some fresh ideas for what to cook for breakfast, lunch and dinner, I wanted to share with you a week of meals in the life of a thai foodie! Rocco loves waffles, well at least for now. At 20-months, he is at the stage where he will ask for blueberries every hour, and then the next week not care a lick about them. While Rocco is in his waffle stage, I’ve been making them for breakfast once a week and saving them to use throughout the week. This is one of my favorite Whole Wheat Waffle recipes at the moment, and I always throw a banana in there since I love Banana Whole Wheat Waffles! Dom’s Thai tongue isn’t a huge fan of waffles for breakfast. He eats the same thing for breakfast every morning: oatmeal, and two fried eggs doused in Thai Seasoning Sauce, garlic powder and pepper. But sometimes when he sees us licking the peanut butter and nutella off our forks he gets a little jealous and takes a bite! 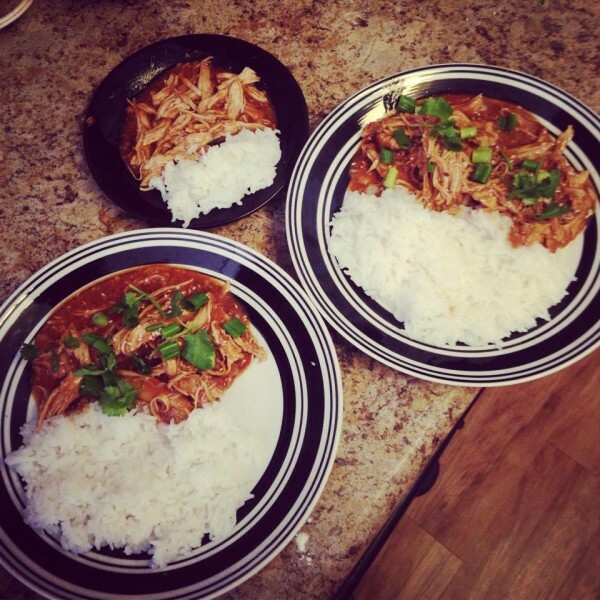 We had some Thai basil I had been planning to use, but we would be out at a meeting for dinner, so I decided to use it for lunch to make Krapaw Gai Nuang, one of my hubby’s comfort foods. 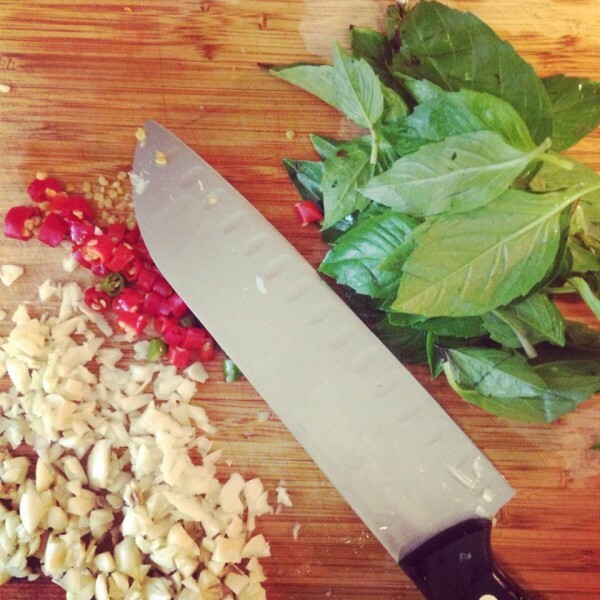 It’s so easy to make, just chop up garlic and Thai chili peppers, pluck off some Thai basil, stir fry some meat with the garlic and peppers, add the sauces and and toss in the Thai basil at the end! At our meeting they served us Chipotle burritos! It’s the one meal I always miss when I’m in Thailand, and I could eat it every day for breakfast—I almost do, but don’t, so I wont get tired of it! My hubby was so sweet and made me one of his specialities! I’ve had a cold this week, so the soothing broth was so refreshing for my body and soul! Dom was walking around our apartment community with Rocco, and saw one of our neighbors. She asked where I was, and Dom said I was making pizza for dinner. “No, she makes her own crust and sauce and everything,” Dom said. “Wow! !” Our neighbor said in awe. Whenever I make pizza, I’m always surprised at how much longer it takes than I thought it would, but how much I savor making my own Thai Pizza. The only time I make it is when Rocco is napping or hanging out with Paw, or I have a friend to help me cook. Since Rocco usually likes to be attached to my hip like a little monkey during the evening, it’s rather tricky/dangerous to chop up garlic without chopping him too! I usually put chicken on our Thai pizza, but since we had Aidells chicken apple sausage in the fridge, I used that instead, and it was yummy! I usually put natural peanut butter, honey and banana on my bagels, but Dom had eaten our last banana, so I decided to use peanut butter and German Nutella (which tastes way better than Nutella you can buy in America) our German friend had just given us. Dom had the leftover Krapaw Gai before running out the door for work, but I like to have light lunches, and lately Baby Girl and I’ve been craving avocados like crazy. Rocco must realize that soon Baby Girl is coming so he wont get as much one-on-one Mee time. Like I mentioned before, it’s been such a challenge to make dinner lately since he wants me to hold him or play with him nonstop. That’s why I decided to just not fight the battle of him crying and tugging on my skirt while I’m chopping meat, and use the slow cooker. 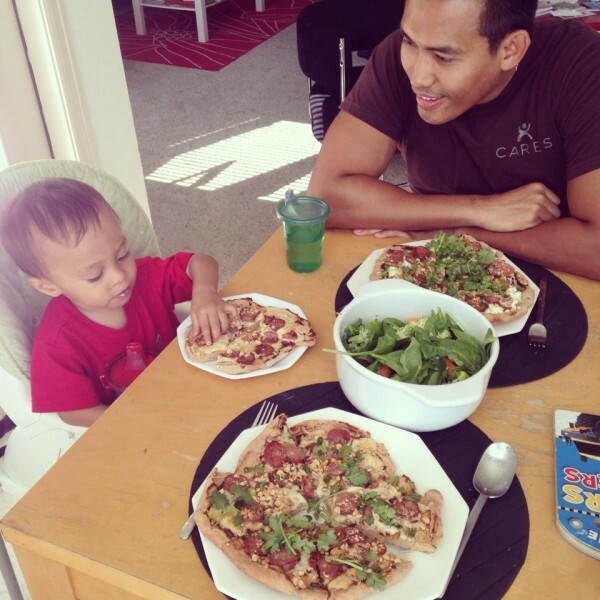 Our friends invited us over one night and made this dish, and Rocco kept gobbling it up! I decided to try it out, and have a stress-free night of just snuggling my boy instead of trying to cook while he snuggled me. Again! Ahh! So refreshing for my pregnant self! Sometimes Dom’s work provides breakfast or lunch, and Dom brings us the extras—he is the best! This time he brought home breakfast tacos with chorizo during his lunch break. It was such a delight to eat them with our friends while sitting around our apartment pool. I made honey whole wheat bread in the bread machine the night before, and I was in the mood for french toast, so I made it, and I packed it to take on our run. Rocco savored it in his jogging stroller, while I ran. Then I ate mine while he played at the park on the slide after my run. I had my friend over for lunch, so I made us a Thai Omelette to savor together while we caught up on life. Dom had wanted to give her a bunch of Mama Noodle packages to take home that we had gotten in Thailand, so I made her some Mama too! 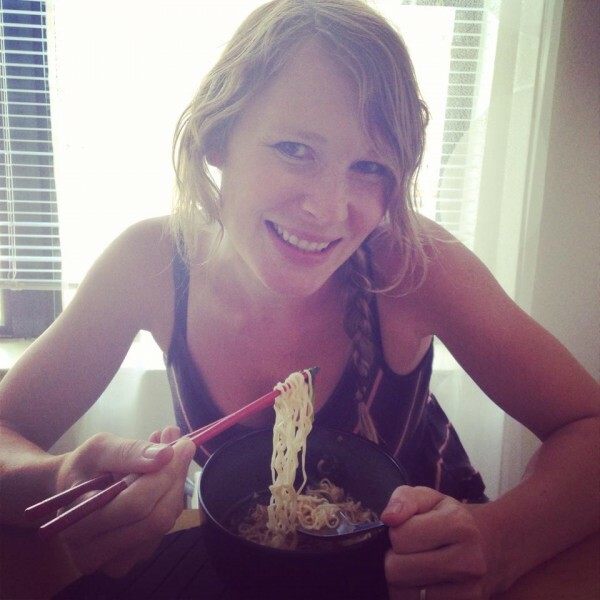 We try to have a vegetarian meal once a week, which I love, and my hubby probably dreads. He is such a carnivore, but we like to save money and save the world a little bit. So I made my Thai Red Curry with Green Beans, but changed it up and added chick peas instead of chicken and brussel sprouts instead of green beans. Rocco even loved it! And we stopped at the Farmer’s Market that morning and got a fresh Cherry White Chocolate Whole Wheat Scone, which Rocco ate most of! They were still in the fridge, so why not! Our friends invited us over for fajtias, and asked us to bring dessert. I didn’t have many ingredients or time, so I whipped together one of our go-to desserts, Blondies! Told you I could eat it almost every day! One of my favorite quick lunches. I love that at HEB, the grocery store here, the bakery makes its own fresh whole wheat tortillas! It was a cloudy, dreary day, so Dom decided to make Tom Yum Mama Noodles again since we felt so cozy. 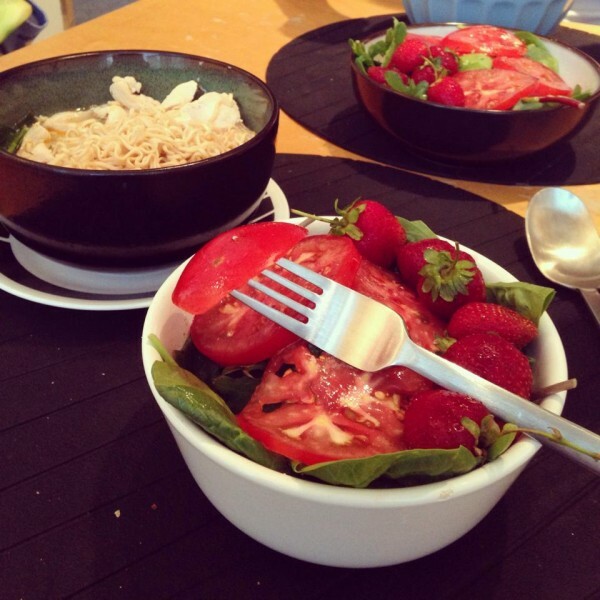 He also made a salad with perfect tomatoes and strawberries we had gotten from the farmer’s market the day before! Of course not every week is the same! We often have friends over and make their favorite Thai dishes for them, or we go out to eat because we are tired of cooking and cleaning up. I always make a menu of what we are going to eat for dinner each day of the week before my grocery shopping day, which means less stress for what to make for dinner. We hope you can stop by one day for a Thai dinner with us! Seriously, we’d love to have you!